Dutch Apple Dinner Theatre tickets are no longer available. The Dutch Apple Dinner Theater has been providing breathtaking Broadway musicals and mouthwatering dinner options since its first showing in 1987. You'll be able to choose from a wide range of appetizers, salads, and desserts as well as enjoy an extensive buffet style dinner while singing along to your favorite Broadway productions. Since the theaters opening, the Dutch Apple Dinner Theater has been putting on magnificent Broadway performanes by talented actors and actresses from across the nation. These actors and actresses bring you old favorites such as 'West Side Story' and 'Oklahoma!' as well as emotional rides like 'Les Miserables' and 'Funny Girl'. 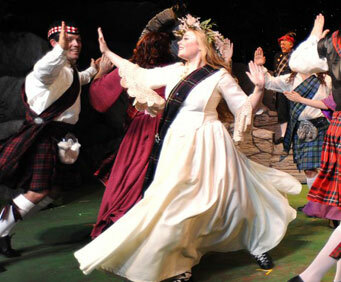 The fun is limitless at the Dutch Apple Dinner Theater! Before the show, you'll be able to enjoy an extensive buffet-style dinner and salad bar full of your favorites. Appetizers are also served, as well as coffee, tea, and water, and you can build your dream dessert at the assorted dessert bar. Laugh, sing, and clap along to your favorite Broadway musicals that take place all year. You can experience comedic relief with 'Mid-Life: The Crisis Continues!' and 'Church Basement Ladies: A Mighty Fortress' as well as holiday favorites like 'A Wonderful Life' and 'A Christmas Story'. For years, Broadway productions have captured our hearts with relatable characters, catch show tunes, and timeless stories of life and love, and the Dutch Apple Dinner Theater combines the big show feeling we love with amazing dining options that makes the theater a must to visit with the whole family! I had never gon to a dinner theater before. When my sister and i went to this one we where mesmerized! What a show! We now go all the time. Just saw the sound of music yesterday--beautiful production! The food is o.K, but the show is the reason for being there. Some drinks are not included in the ticket price, and the soup seemed to be an add-on, which i wasn't thrilled about. For the bigger tables it is family style and a bit crowded. It is better to sit in the fron of each section (2 rows per section). Looked like a lot of bus groups occupied the front two sections. Back row seats aren't too bad. For the show--maria was outstanding. I've seen this production many times, and she is one of the bets maria's i've seen. Great presence and great voice. The children are wonderful--liesel was great, and the little blonde gretl was a joy to watch. Mother abbess was very, very good and had a very powerful voice. Ducth apple has picked a great show and produced a wonderful production. Many thanks! We enjoyed it very much. The food was very good and the wait staff was attentive. We had wonderful seats for the show and the actors & actresses were great. It was our first time at a dinner theatre and we would like to do it again. The show was absolutely fantastic. Had a great time.